Cardiac Arrest: Vickie Robert Foundation Launches Campaign On "Every Child A Life Saver In Nigerian Schools"
HomeCardiac Arrest: Vickie Robert Foundation Launches Campaign On "Every Child A Life Saver In Nigerian Schools"
High rate of cardiac arrest will soon be a thing of the past as the Director of The Vickie Robert Foundation, Ambassador Vickie Robert, a Nigerian Ambassador for Peace in the UK has urged the Nigerian Government to introduce First Aid/basic Life support in schools to make every child learn Cardiopulmonary Resuscitation (CPR). In first of its kinds in Nigerian schools, this Nigerian Ambassador for Peace in Diaspora who is a registered nurse in the United Kingdom said, the should be an important aspect of learning so that when these children leave school they would have known how to save a life. We recognise the pressures on teachers to deliver a busy curriculum and are not proposing time-consuming additions. Training in key skills can be achieved in as little as 30 minutes. Bolton footballer Fabrice Muamba was given CPR when he collapsed on the pitch from a cardiac arrest in March 2012. But a serving Nigerian Senator, Alhaji Isiaka Adeleke, an Uncle to music sensation, Davido was unable to be saved few days ago in Osun State, Nigeria, as he reported died of Cardiac arrest. A cardiac arrest is when the heart suddenly stops pumping blood around the body. Each year, a high number of people in Nigeria die from a cardiac arrest outside hospital and The Vickie Robert Foundation thinks this could be cut if more people knew CPR. 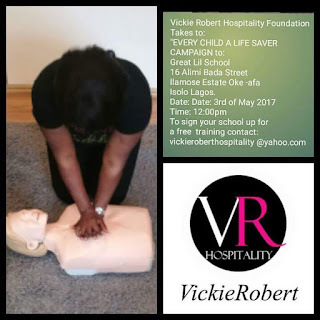 The cost to schools is minimal; Vickie Robert Foundation is offering free CPR training to all schools. 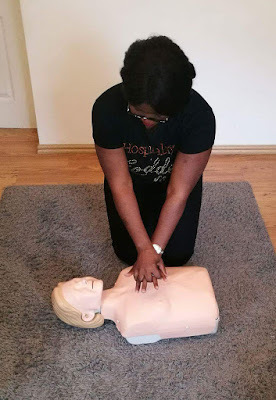 The time has come to make this important life skill part of every child’s education so that, when faced with a collapsed person, they will be confident and competent to intervene and, whenever possible, save a life.